Big Bang Theory and Brothers and Sisters are show that I will definitely catch up on this summer. They are both great shows, but because I have missed some of the earlier episodes, it's too much to try to watch them now. American Idol--too much. TOO MUCH. I love just about everything about Idol and was so excited about Ellen, but really, it is just too much to try to watch it every week. Maybe next year? 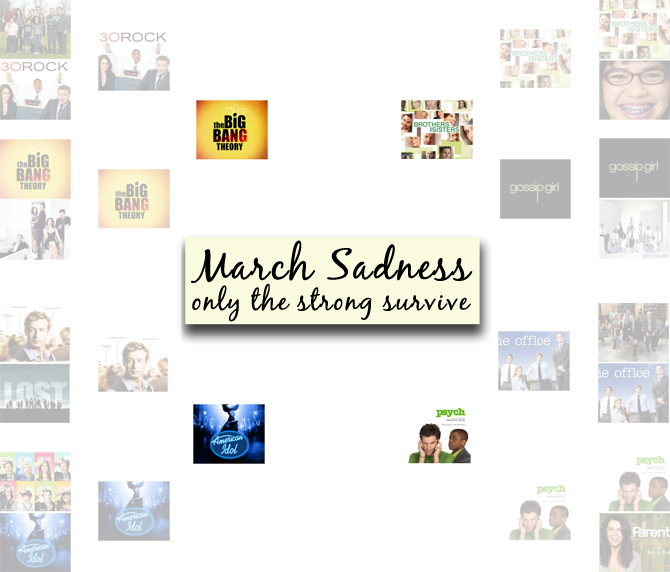 And Psych... luckily it is done for the season. I know, cheap. brothers and sisters hyped up this big two hour "movie" on sunday night and i sat down excitedly to watch...dud. nothing that epic...still entertaining, but i worry about where that show is headed. I'm with Lu on this one. Bros & Sis might be LAME without hot Rob Lowe. i am obsessed with parenthood. i mean, i love brothers and sisters, but parenthood is way better. absolutely hilarious and real. check it out. Lucille: And I’m putting Buster in charge. Gob: He’s a good choice. Michael: Buster? The guy who thought that the blue on the map was land? Lucille: He's had business classes. Buster: Wait... Eighteenth-century agrarian business. But I guess it's all the same principles. Lemme ask you, are you at all concerned about an uprising? Arrested Development is the best.